When you are looking for colorful religious centerpieces for Easter or any other Christian celebration, this lovely lollipop bouquet will be perfect. Christian centerpieces come with pastel pink, yellow, mint green and purple lollipops, a total of 15 treats. Each is individually wrapped in a clear cello bag for protection. This means your friends and family can take home a lollipop after the celebration has ended; A real benefit to having an edible candy centerpiece. Lollipops are housed in a white pail, five inches tall, with ribbon decorations. The finished product is 15" tall and 12" across the top. 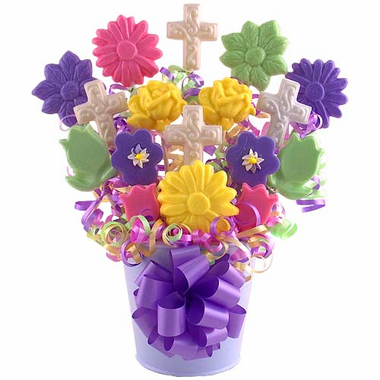 IMPORTANT: While many customers use this lollipop bouquet as religious centerpieces, there is a front and back, and the front is finished and more attractive than the back. Ingredients Hard Candy Nut Free Lollipops: Sugar, Corn Syrup, Natural & Artificial Flavors and Colors. May contain Red 40, Blue 2, FD&C Yellow 5, Citric Acid, Dioxide, Sodium Benzoate. Icing pieces contain egg whites & salt. Chocolate in brown lollipops. are individually wrapped in a clear cello bag. There are a variety of handcrafted lollipops in yummy flavors which include cotton candy, cherry, marshmallow, watermelon and lemon.